A workshop participant (left) and Khamisa Abdalla, ACCC Women's Program Manager (right), work on craft projects as they learn entrepreneurial skills. "Crafting Culture in the Middle of Everywhere” is a new workshop series and research project coordinated by the Department of Textiles, Merchandising & Fashion Design in the College of Education and Human Sciences. 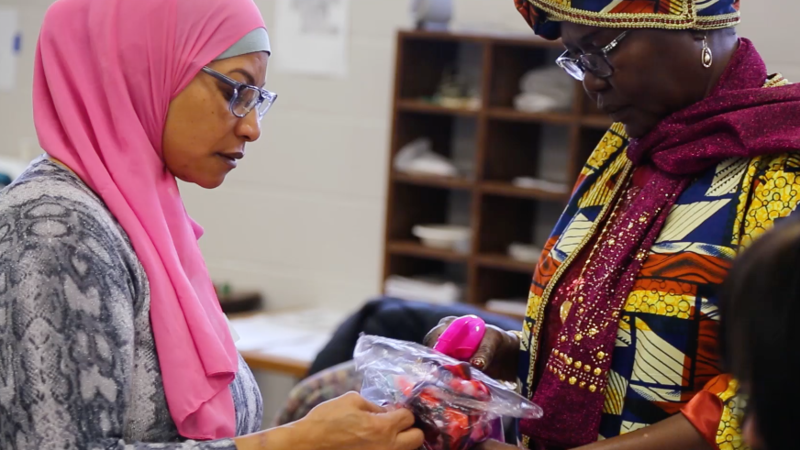 The project fosters cross-cultural exchange and social connections between immigrant communities and long-term residents of Nebraska. Another goal is to develop skills related to entrepreneurship and business acumen and to spark relationships and ideas that will ultimately contribute to the “micro-ecology” of entrepreneurship for immigrants and minority communities in Nebraska. The outreach project was initiated by Claire Nicholas, assistant professor, and Surin Kim, assistant professor and extension specialist, in Textiles, Merchandising & Fashion Design. The Pearle Francis Finigan Foundation is sponsoring the project. Other supporting partners are: The Asian Community and Cultural Center, the International Quilt Study Center and Museum, the Lincoln Modern Quilt Guild, the Nebraska Business Development Center-Lincoln, College of Education and Human Sciences Research and Design Studio, Nebraska Innovation Studio, and the Quilted Conscience. The project would like to acknowledge the important partnership with the Asian Community and Cultural Center, whose staff provided key resources and assistance in communicating with workshop participants. More information about the center's programs can be found at: http://www.lincolnasiancenter.org/.